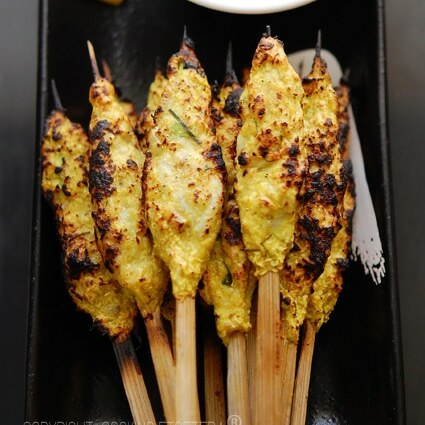 Sate (Indonesian spelling) or Satay (Malaysian spelling) is one of the most loved foods in Southeast Asia. Today, I have the talented Dhi at Cooking Etcetera as a guest writer on Rasa Malaysia. In collaboration with Pepy of Indonesia-Eats, both of them will be writing about “Highlights of Indonesian Cuisine” and start the series with Indonesian sate. I am personally very excited to learn more about Indonesian cuisine and I hope you will enjoy (and follow) their guest posts here on Rasa Malaysia. Please welcome Cooking Etcetera. In light of the growing interest in Asian cuisine, particularly Malaysian, Indonesian and Singaporean cuisine, Indonesia-Eats and I have started a guest post series “Highlights of Indonesian Cuisine” on Rasa Malaysia. We aim to introduce Indonesian food to the food blog community and explain what Indonesian food is really all about. To kick start the series, we are sharing some of the most popular Indonesian Sate recipes with you. Indonesia is a nation comprised of more than 17,500 islands that span across a wide geographical area. As a result, Indonesian cuisine is diverse as it’s paired with the influences from the many culture in the archipelago. Sate (or Satay) is a dish consisting of diced or sliced chicken, goat, mutton, beef, pork, or fish. Sate is commonly threaded onto bamboo skewers, grilled over charcoal fire or coconut-shell charcoal, and then served with various spicy dipping sauces. Indonesia is THE home of Sate. Indeed, sate is claimed as Indonesia’s national dish, and its reputation can only be matched by “Soto” or the aromatic and higly fragrant Indonesian soup. Highlights of Indonesian Cuisine is a collaboration between Rasa Malaysia, Cooking Ecetera, and Indonesia-Eats. Balinese food is known to have stronger flavours and aroma due to the generous use of lemongrass, chilies, lime leaves, galangal, and other spices. The seafood sate sold in Bali has beautiful distinct flavours. Instead of being doused in rich sweet peanut sauce, it is served plain, fresh off the grill without any sauce–letting the sweet flavours of char-grilled seafood and exotic spices burst in the mouth. In my Sate Lilit Bali recipe, I added a special Balinese dipping sauce. How do the Indonesians eat sate? We normally eat sate with cubed rice cake or with a bowl of steamed rice as a main/side dish for lunch, dinner, midnight snack, snack or appetizer in parties or social occasions. Certain sate is actually served for breakfast to go with Indonesian chicken congee. Here is my recipe for Sate Lilit Bali. Mix both fish & shrimp in food processor until smooth. Mix in desicated coconut. Add 3 tablespoons of thick coconut milk. Add processed ingredients, mix well. Add salt & sugar to taste. If the mixture is still too dry, you may add 1 egg white and a bit of olive oil. Shape the mixture on sate sticks/lemongrass stalk, flatten slightly. Charcoal grill sate until light brown and cooked through. I love sate lilit. Had lots of them when I was in Bali. Haven’t even attempted making at home.. I love the shot of sate lilit…good shot!! MMMmmm this looks phenomenal! How do you make the sauce? This one of my favorite appetizers when I go eat at Thai restaurants although I wonder if the seasoning is all the same? Love the presentation in the cool glasses. Perfect for a glam cocktail party. This is a very interesting sate like the Vietnamese shrimp on sugar cane strips. Look forward to more varieties. Beautiful! Love the presentation and photos. I am going to make this!! I love how Rasa Malaysia has become THE source for amazing Southeast Asian recipes, not just Malaysian. Thanks for introducing me to great new blogs/bloggers too with your guest blog series! Interesting to see here satay served without the creamy chunky peanut sauce. I haven’t found any US satay that offers the same flavor we had from home. Some say the way they grilled them here, without the charcoal. I think the frozen meat we get here, too, making it less favorable. Looks so yummy yummy delicous. I love you pictures always and they way you have presented them. Awesome presentation in the long glasses! who wud hv tot of that! This sate sounds good! Amazing photos! WOW! Beautiful photographs and i definitely can’t resist the urge to try the recipe! Thank you for sharing!! What is the dipping sauce in the bottom of the shot glasses? How to make the chilli sauce? “Processed Ingredients” in the recipe are for the sauce. That looks enak! I have to make these.